This methodology has been selected to be part of the new ICAO Fatigue Management Guides. This new method has been developed to assess fatigue risk associated with a particular duty or work pattern due to the lack of fatigue-specific risk assessment methodologies and the shortcomings of established risk assessment methodologies. The proposed “Fatigue Assessment and Mitigation Table” is a simple and profound approach to assess fatigue of a single duty or type of shift, based on numerous scientific studies. This methodology starts by the identification of the root causes of fatigue and provides effective mitigation measures in very short time. Mitigations include the previous nights, shift-changes and workload factors. Fatigue is a human factor topic since it impairs human performance capabilities. ICAO SMM proposes a more specific analysis process for the assessment and mitigation of human factors (HF). A HF fatigue analysis should provide an understanding of the impact of human performance capabilities on the situation and should contribute to the development of comprehensive and effective mitigations. This supports the concept to develop the Fatigue Assessment and Mitigation Table. The starting point of risk management is the identification of a hazard. Since human fatigue is already an identified human factor hazard particularly with any kind of shift work, the author proposes to identify the “causes of fatigue” of a particular duty or work pattern rather than to identify a certain duty as a fatigue hazard. In general, fatigue is not considered to occur as a random event. It conforms to expectable patterns and may be analysed and predicted in order to be properly managed. Hazard identification may be reactive, proactive or predictive. This may be applied to the identification of “causes of fatigue”. The methodology proposed by Tritschler may be used in all three categories. Two technical papers explaining different risk assessment methodologies have been published by Kristjof Tritschler in 2015. The ICAO definition of fatigue includes 4 causes. 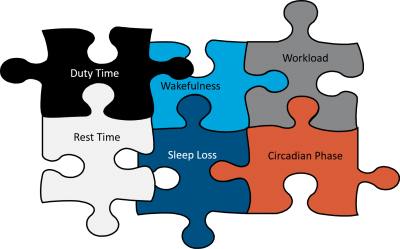 Sleep loss, wakefullness, workload and the circadian phase. Before FRMS we tried to manage fatigue by maximum duty times and minimum rest times, which is an other game. These parts do not fit to the interaction of the 4 causes of fatigue. The 4 fatigue parts have been shown first at a conference in 2008. The black and White parts where added for a presentation at Singapore in 2012. The “Fatigue Cake” is an illustration with three areas, where fatigue can be managed. The most important part is the “Roster Design”, which forces people into shift work that deviates from the natural sleep-/wake-cycle. So wakefulness is required at work, when the circadian body clock promotes sleepiness, as well as where rest times are provided, when the circadian cycle would rather promote wakefulness. The second part is “Lifestyle & Sleep”, where people in shift work have to manage their sleep-/ wake-times to be either fit for duty, or to recover from their pervious duty. The strategy to manage sleep-/ wake-patterns in shift work is not intuitive. The “Roster Design” and the “Lifestyle & Sleep” parts interact, since the roster may contain rest times, where sleep is possible, or not. At the same time, the “Roster Design” may be used strategically to facilitate wakefulness during very demanding duty times, when the circadian cycle is taken into account. The lower part of this framework is “Workload”. On one side are the “Workplace Conditions”. Conditions what tasks the people have to perform, as well as the resources provided to fulfil the job. The other side is “Workload Management”, which consists of the idea how people manage their workload, how they use times of boredom as well as how to plan ahead and avoid high workload during work, or plan tasks when human performance is impaired by fatigue. Fatigue Risk Management is a shared responsibility. In this illustration, the left part consisting of “Roster Design” and “Workplace Conditions” is the responsibility of the organisation. This left part describes when and what the workforce has to do. 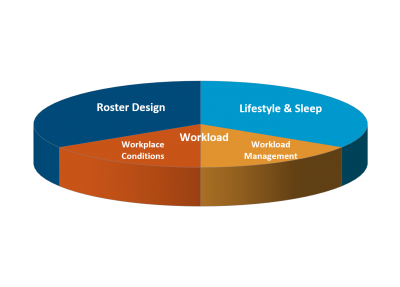 The right part consisting of “Lifestyle & Sleep” as well as “Workload Management” is under the responsibility of the individual worker. The Illustration of the “Fatigue Cake” simply illustrates that all three parts need to be taken into account to manage fatigue risk effectively. It also clearly illustrates, that both sides are needed to manage fatigue risk effectively, as a shared responsibility. According our knowledge, the first FSAG has been set up by Dr. David Powell from Air NewZealand, which has been chaired by their medical devision. 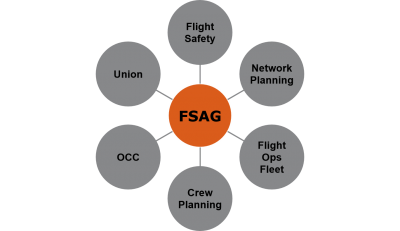 After exchanging ideas with him, the FSAG as shown above has been set up at Germanwings. The FSAG is coordinated by the Safety Manager. It consists of representatives from all departments that have direct or indirect influence on shift work of crews. All members of this FSAG are “Non-Decision-Makers”. That means they act as working group, including representatives from the cabin and pilot’s union. The FSAG works in the scope of the FRMS on a factual, data driven, methodical appraach, independent of politics. The FSAG has been a success from the beginning. Even though many measures had been in place to manage fatigue before, this group achieved a coordination of all fatigue relevant activities as well as to just facilitate communications between relevant departments. The FSAG has been explained at various conferences since 2008. The origin for this has been an SMS management cycle of the first edition of the ICAO SMM. Adopted to FRMS, this management cycle explains which steps are logic. It actually covers the FRM Processes in the first run and all FRM Safety Assurence Processes with the folowing turns. Aiming for continuous improvement. 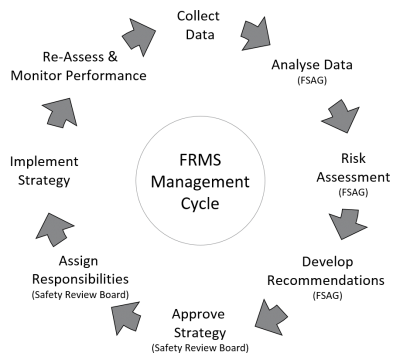 This cycle also illustrates where the FSAG tasks end, and where the decissons are taken, if the FSAG consists of “non-decission makers”. This management cycle has been shown at various conferences as Montreal 2011, London 2011, EASA 2014.